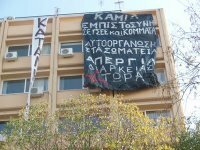 Statements from the assembly of the Thessaloniki trade union centre, which was occupied in solidarity with attacked cleaning worker Konstantina Kuneva. The occupation of the Trade Unions Center of Thessaloniki continues. To organize a gathering of people in solidarity with K.Kuneva in front of the Center on the 31st of December, at 12 o’clock. To have a New Years Day of struggle in the Center, with an open assembly at 18.00. Confronted with the raw and undisguised state violence and oppression targeted against workers’ struggles, and the covert but no less hostile mafia-like machinations of the employers, the Trade Unions controlled by the Trade Unions Centers across the country, among them the Thessaloniki one, do nothing but stammer something like “we try in a democratic way to achieve full social and economic parity for their members, and the other working people”, as their statutory document reads. The multi-fragmented Greek trade union movement on the other hand cannot and won’t go against the governments and the clientelist party-political mechanisms which complement each other in prolonging power and inequality. Indicative of this is the now usual course of trade unionist managers capitalising on their “successful” trade unionist carreers with some government position in the cabinet or ministry and corporate consulting bodies. The General Confederations and the Trade Unions Centers in Greece are now integral strakeholders in the power regime; their basis members and the workers in general must turn their backs on them and their leaders, and choose the way of the independent workers’ and syndicalist unions, for the creation of an autonomous pole of self-directed struggle, beyond and out of parties and mechanisms. The Trade Unions Center of Thessaloniki is the second largest in Greece. Its constituency includes 275 1st degree unions in the Prefecture of Thessaloniki and the Region of Central Macedonia. The Center ostensibly represents 350.000 working people out of which 300.000 work in the city of Thessaloniki. Has anybody ever seen even 100.000 of them in the streets demanding anything? Never! Why is that so? It is simple: the working people themselves know very well that under the Trade Union Centers call, they do nothing but play the setup game of the Center’s management. If the working people realize their power and break out of the logic of being represented by bosses’ accomplices, then they will regain their confidence and thousands of them will fill the streets in the next strike. Konstantina Kuneva, the secretary of the Attica Union of Union of Domestic Workers and Cleaners, was attacked. On the 22nd of December night, she was attacked with sulfuric acid in front of her home by two men. She was admitted to a hospital in a critical condition. She has burns on her face, head, hands and back and there is a possibility that she will lose her sight. The events before the attack and the testimonies of her fellow unionists and workers show clearly this is an act of punishing her for her involvement in the union. The Union is one of the most active workers’ unions within what euphemistically is called precarious labour: in other words, Konstantina is a migrant and a severely underpaid and unprotected worker in one of the most devalued sectors of labour; she decided to join a union in order to struggle against the inhuman conditions imposed to her and her fellow workers; her employers possibly hiring mafia people or in any case with mafia methods, assaulted her. Behind the attack are them and their heavies, who have been threatening Konstantina especially, whom they thought as most vulnerable due to being an immigrant, but other women as well, for their activity in the union. The everyday terror of bosses targets clearly and ruthlessly individuals and unions that resist the wage slavery. The company (OIKOMET) where the 44 year old cleaner used to work had contracts with two big state companies, ISAP (ΗΣΑΠ), the overground metro railway in Athens, and the Greek Industry of Vehicles (ΕΒΟ). Her union had been officially documenting and challenging the severe exploitation its members are subjected to under these contracts, but their constant complaints and collective actions were not listened to by neither the Labour Inspection Service (the state agency assigned with supervising whether labour law requirements are met at workplaces) nor the Ministry of Labour, the General Confederation of Workers in Greece or the Trade Unions Center. None of these pertinent stakeholders ever checked at the company, despite the fact that the terrorism of the management against workers was constant, to the point that if any worker ever complained about working conditions, she was sacked immediately, and despite the fact that, as the vice president of the Union had publicly stated, union members had been receiving telephone calls with life-threatening messages. Konstantina is one among hundreds of immigrant women workers who work as cleaners under a “workers-for-rent” regime. The week before the assault, Konstantina had clashed with the workers-lending company management for the Christmas bonus she and her fellow workers were entitled to and unlawfully refused. The precedent of this clash was the spiteful sacking of her mother by the same company, and the punitive transfer of Konstantina herself to some other working post, far from her home. What was also due then was a tripartite meeting of her, her employer and a state official from the Labour Inspection Service about her official complaints. Situations like these are not at all rare in the field of cleaning and employee lending companies. On the contrary, this is the rule when it comes to cleaning company contractors: delayed contracts, stolen wages, stolen overtime payments, differences between contract assets and what the employee actually gets paid, selection of almost exclusively immigrant male and female workers with green card status (legal residency in Greece ranging from 1 to 5 years - in most cases only 1 year) so they can be held in a state of hostageship, social security benefits that are never attributed. All these under the support of the public sector and enterprises which are aware, incite and support working conditions reminiscent of the middle ages. OIKOMET in particular, a cleaning company with enterprises all over Greece and owned by Nikitas Oikonomakis who is a member of PASOK (Greek Socialist Party), “officially” employs 800 workers - on the other hand, workers say that their number is at least twice as much and during the last 3 years the turnover amounts to 3000). Illegal procedures on the part of the employer company are on the everyday list. To be more specific, employees sign “blank page contracts” and they are never given a copy of them. They work 6 hours a day but get paid for 4,5 (including stamp) because in this way they appear to be working less than 30 hours per week on paper and the boss is not forced to include them in the “higher stamp category”. Employees get terrorized, they get unfavourable transfers, they get fired and blackmailed into resigning voluntarily (a female employee was threatened by her employer into signing her resignation after being held for 4 hours in a space owned by the company). The boss organised a “yellow” (company) union in order to manipulate employees while he fires and hires people as he wishes, ruling out any prospect of communication inside the workplace or collective action. The murderous and hideous assault on Konstantina stands for an attack to every working man and woman, every unionist; it is an attack against the society that resists. Just like the cop’s bullet that killed Alexandros Grigosopoulos pierced through the hearts of us all, the acid that burned Konstantina’s body has fallen upon the flames of our wrath. The rage of the December’s insurrection manifested in clashes with the forces of oppression, in the hundreds arrests of pupils and students, in demonstrations and militant assemblies in neighborhoods and occupied universities, in the wealth of solidarity actions…this rage is developing into an unpatronised autonomous movement for social emanciopation, against the intermediation of struggles. The murderous attack against the unionist Kuneva is the state’s response, through its heavies, to this movement of rage and emancipation. December made it clear that the state has the face of the murderers it hires. The killing of Alexandros Grigoropoulos, the gunshots by policemen during the protests, the chemical war against protestors launched by the now world-infamous riot police, the injury of the pupil in Peristeri by some “unknown” gunman, the “inscrutable” cases of police brutality against student protestors and the murders of migrants on the borders and in the cities…and now, Konstantina. After these events, there can be no buts and ifs. Killers in uniforms kill in cold blood. State and corporate heavies loom in street corners and alleyways for us. We are in a war. In this social-class war there can be no zones of neutrality. In this war, silence stands for complicity. The fake tears for Konstantina the state sanctioned managements of the General Confederations of workers and employees (ΓΣΕΕ and ΑΔΕΔΥ) and the Trade Unions Centers representatives shed, they fool no one anymore. The state well-fed trade unionists and the sold-off fat cats of the official trade unions are accessories in the murderous attack on Konstantina. With their backing, the regime of renting workers and the modern slave-trade of immigrants have been made into the rule for thousands of workers. The state sanctioned and paid professional unionists have never mounted even some symbolic strike for the stolen wages and the overtime work-hours of rented workers. They have never mounted not even some symbolic strike against the modern slave-traders of migrant workforce, which hire immigrant women workers en masse and keep them hostages of the most inhuman arrangements and working conditions. After all the denouncements of this regime Konmstantina’s Union made, why have they not mounted even some symbolic strike? Konstantina fought against these medieval conditions of labour and payed for this a heavy price. Her genuine syndicalist action is what led to the attack. We occupy today the Thessaloniki Trade Unions Center to resist state oppression expressed in murders and terrorism against working people. We occupy the Trade Unions Center and obstruct its administration; we do not obstruct the workings of 1st degree unions; far from it, we appeal to them and to working people to join this common struggle. We occupy the Thessaloniki Trade Unions Center to resist the state oppression of murders and terrorism against workers. We occupy the Center and obstruct its management, not the workings of 1st degree unions, to whom we make an appeal to join our struggle. We occupy the Center whose management has after all and since many years lost the trust of workers, since it has been doing everything but playing the role it is supposed to. Instead of fighting for the workers’ emancipation, the state-paid official trade union center managers deceive and mollify society and serve the order of the regime that hired them. We welcome all students and pupils, workers and citizens, to join the occupation and take part in it: together we can turn it into a liberated center of action and solidarity with Konstantina Kuneva and the people prosecuted for December’s insurrection. We are not against the working people organized in unions, as the state paid union managers are bound to accuse us of. On the contrary: we ask from every union and individual worker to go beyond the treacherous lead of those in power, and join us in the common struggle. Workers’ rights are on the decline and in a very difficult phase around the world. The employers’ demands for more flexible working hours and cheaper wages meet with the utmost willingness on the legal mechanisms of the state part to concede them. The corporates’ project is to minimize the cost of production on a global scale. To implement this, they have been openly cooperating with states and governments, and in this direction they first achieved to minimize import and export duties. This paved the way for an unprecedented decentralization of production. A company now may have its headquarters at some state in the West and keep its production plants at some other state where wages are much lower. The result is simple: workers in the west struggle with unemployment and workers in the poor countries receive next-to-nothing wages. This situation, euphemistically called globalization, has mounted up to the bleak present workers around the world are confronted with. The other side of the same coin are the people in poor countries, whose migration to developed countries is part of the effort to improve their lives. As migrants, they work under the worst conditions and receive the lowest of wages. In many cases, being unable to escape the conditions that ruin their lives in their countries of origin, they have to pay large sums of money to slave-traders and as meat for sale to be transferred to the EU job markets. This huge business of slave-trade secures large profits, and the western states cannot fool us: they do not fight it, they benefit from it, they make money. Cheap working hands and minds, with the minimum of entitlements in protection, welfare and safety, are what maximizes these profits. One instance of this reality is the giant sweatshop of the Athens 2004 olympic games (13 people died in the construction sites, 65 people died in the whole event’s supporting work, and hundreds were injured). These should be enough to make clear that the whole thing is orchestrated on the basis of bosses’ common interest and that this deadly condition of exploitation is accentuated by the states’ compliance; the extent of this accentuation is directly dependent on the extent of decline of the labour organizations’ force, which long ago ceased to represent the true workers’ interests. In Greece, the ΓΣΕΕ and the Trade Unions Centers have abased themselves into mechanisms of intermediation of the employers through the workforce, and have betrayed the radical and militant history of the workers movement. Their leaders are a bunch of civil servants who operate as a branch of the Ministry of Labour. They abuse everything workers’ struggle have earned for themselves. They turned their unionist responsibilities into private and individual privileges. Our interest in work and life is common, for every worker, irrespective of gender and country of origin. Greeks and migrants we have to reach a common voice and struggle together for justice and equality, equal rights in work and life. Konstanina Kuneva is one of us. Her struggle is for DIGNITY and SOLIDARITY; her struggle is OUR STRUGGLE. We struggle for the abolishment of the workers-for-rent companies which consolidate the informal market and the legislation behind it. We struggle for equal wages for immigrants and Greeks. We struggle to include in this all migrants, to raise their voices along with ours and make our common appeal strong and inclusive, antiracist and interracial, for dignity and justice. The full investigation and tracing of the murderous assault against Konstantina Kuneva. We demand that perpetrators of the crime and those who hired them are brought into justice and pay for their crime. That all the evidence about the working conditions at OIKOMET are brought into public knowledge, and that Konstantina’s Union’s demands are vindicated. That ΓΣΕΕ and the Trade Unions Center finally assume their responsibilities and call for a general strike in solidarity with Konstantina and those prosecuted for December’s insurrection on January 9, 2009, the day of the pan-educational demonstration. I think the proletariat cannot fight unionism with another brand of it. Unions today are all instruments of capital to derail working class struggles towards communism.